a3Genealogy: Could He Pass for White ? When Wiley J. Morris (Tobe) left Cocke County, Tennessee in 1884 he carried with him nine of his eleven children. He and his family traveled to the open lands of central Kansas in November of that year and all five girls and four boys survived the trip to Harper and later Comanche County. Yes, Tobe had the typical issues that parents have with teenagers, like with young Jennie who eloped around Christmas time in 1885 at the age of sixteen. But this was excusable, since there was a “man explosion” in her world. With the work the Comanche Pool brought to Coldwater Kansas a new breed of men - cowboys and northerners - came with it. Jennie quickly fell in love with a Pennsylvania fellow, got married, had a child, and a divorce all before she was twenty one. Of course, the family rallied around her until she was able to find a more perfect husband. In general though, Tobe’s children walked a straight line to success the old fashion way, applying hard work and overcoming obstacles. His girls married well, the family was educated, and his sons amassed property. Some settled in Nebraska, others in Oklahoma, and eldest son Chris landed in California. But then, there was Horace - the youngest son, number ten of the Tobe and Martha Morris family unit. Horace disappeared. I’m sure his purpose, too, was to better his life as his siblings, but he found a quicker route. He passed for white. Perhaps I should have mentioned that this Morris family was an advantaged mulatto family. They were advantaged because they were always land owners and were always free coloreds due to Tobe’s mother. Having never been slaves, her family had owned land as early as 1817 in North Carolina. Her five children, and thirty one grandchildren, could read and write with precision. 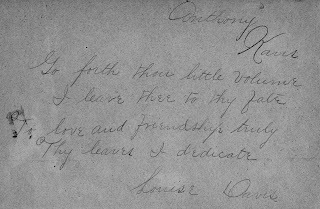 Examples of eight of Tobe’s children’s poetry or notes can be seen in eldest daughter’s, Louise, autograph book. Son David had died early, leaving Horace the only one not traceable. Like all “coloreds” who passed for white, Horace broke all contacts with his family. Of course, his siblings knew his whereabouts, as did his father, but they honored his wishes and never contacted him. He was the “black sheep Morris.” Last heard, around 1930, he lived somewhere near Sedan, Ks. Really neat story. Thanks for sharing! Kathleen, thanks for this great post. I'm enjoying reading through your blog! One of my brick walls is an ancestor who moved to NY and lived as White. His name was William A. Green. I never even knew he existed until I started doing this research. I am hoping that one day I'll be able to learn more about him and find his descendants (if any), but he's made it pretty hard for me to find him! Wonderful story! This is the exact problem that I am having with finding all of my black ancestors, almost all it seems were "mulatto" and I have even traced that a couple of them were later listed as "white" on certain census reports and then it seems that they "disappear" from the face of the earth. yes, he could easily have passed for white. and why? because white people aren't looking at everybody they see for some trace of african heritage. i have a not exactly cousin who had a great uncle who went west and first passed with his light complected wife and sons and eventually left them and married a white woman who had no idea he was not white. 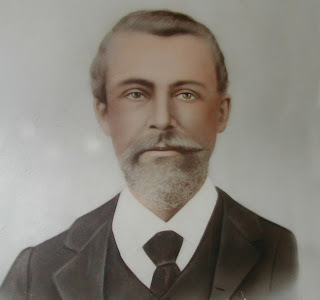 while doing research this man's "white" descendent met my not cousin. Together they were able to add more to the story. Another sister had gone to NY and passed and her family was found too. Everybody took it very well and talked and exchanged photos and information.